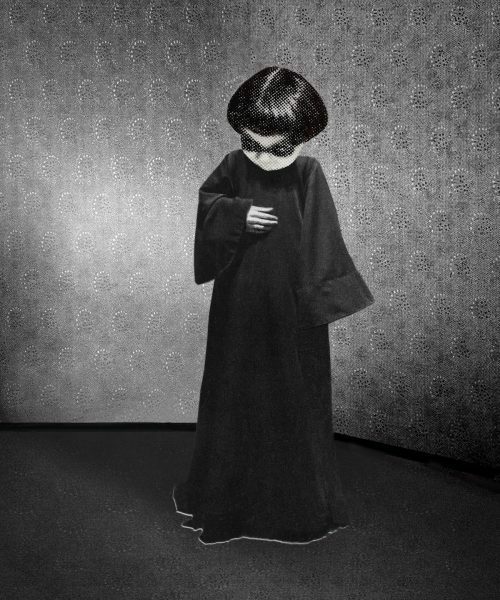 Pat Brassington, Fever, 2018, pigment print 75 x 64 cm. Pat Brassington, Curfew, 2018, pigment print, 150 x 64 cm. Pat Brassington, Electric, 2018, pigment print, 86 x 67 cm. 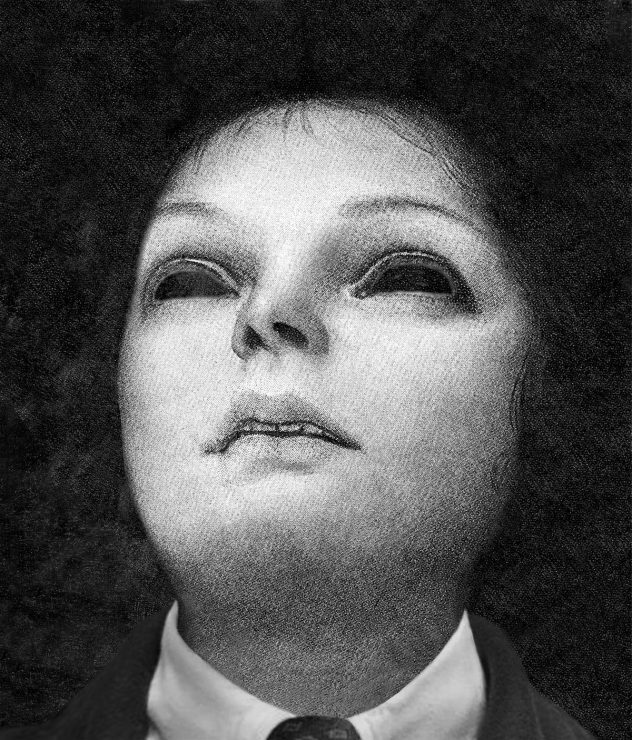 Pat Brassington, Sans, 2018, pigment print, 85 x 69 cm. Pat Brassington, Sunset, 2018, pigment print, 80 x 66 cm. 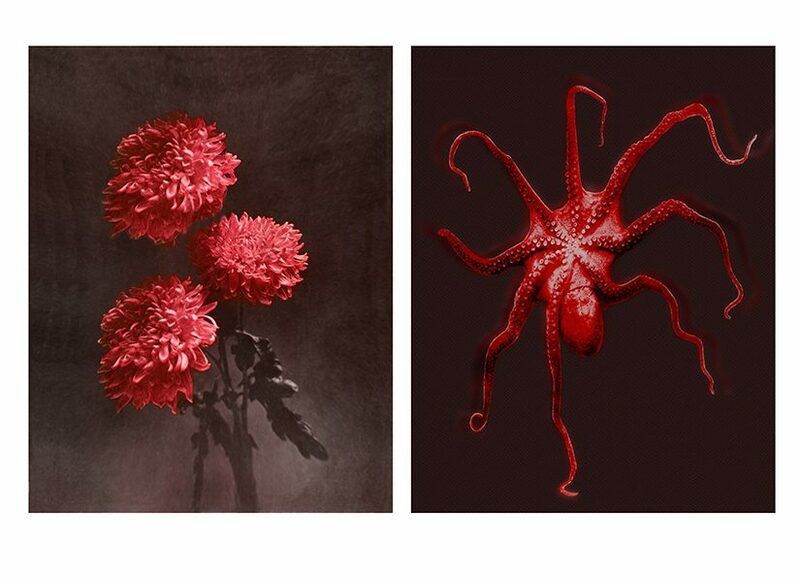 Pat Brassington, Plain song, 2018, pigment print, diptych: 80 x 62 cm (each image). 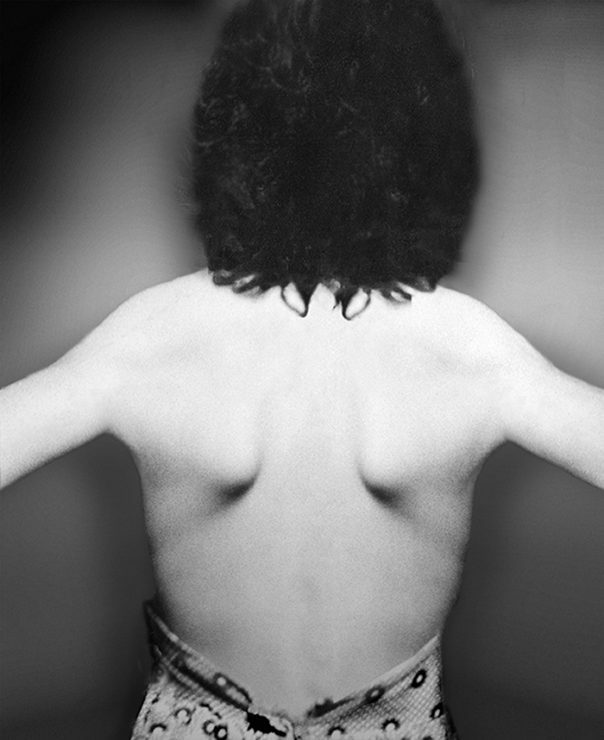 It is well known that contemporary photographer Pat Brassington is heavily influenced by surrealism, psychoanalysis and feminism. Despite this, the exact meaning of her uncanny images remains almost impossible to pin down. Her new exhibition, On A Clear Day, is one of the first to be displayed in Bett Gallery’s new space inside the Studio 65 building, a former office tower turned creative hub in the Hobart CBD. Working predominantly in photo-montage and digital media, Brassington’s compositions and aesthetic have remained consistent throughout her long career and her images often feature a central figurative element in front of a subtly patterned backdrop. 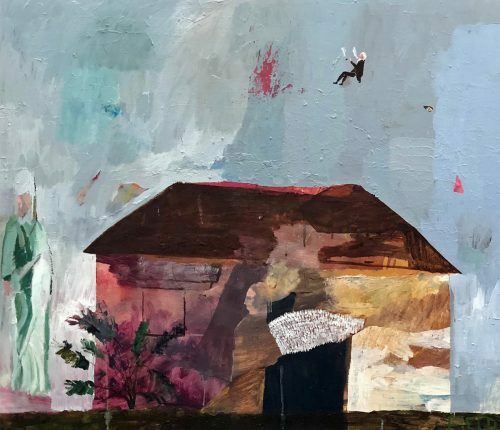 On a Clear Day does not feature the bright colours the title suggests, instead Brassington’s works are swathed in shades of red and black and the overall feel of the show brings to mind David Lynch films, dreamscapes and the sublime. It is an intimate show sharing the gallery space with another solo exhibition, MISTAKE, by Tasmanian painter Amanda Davies. Coincidently, Davies won the 2017 Portia Geach Memorial Award for her portrait of Brassington, which is also hanging in Bett Gallery. At first glance, the human protagonists in Brassington’s exhibition appear strangely familiar. On closer inspection, it becomes evident that they possess slight anomalies that render them unfamiliar. In Fever, 2018, an androgynous figure turns its face upwards with mouth slightly agape. The image is not crisp like a photograph, instead the surface is grainy, as though a veil of static hangs over it. The eyes have been enlarged, pupils dilated so heavily that the entire eye is watery black. These slight manipulations of the body are a definitive part of Brassington’s long term practice and contribute to the surrealist style of her work. As an art student in her early 30s, Brassington studied printmaking alongside photography and while she now works with digital mediums, there is still an allusion to the printmaking process in her images. The surfaces in On a Clear Day appear to possess an ambiguous, misty depth as the inks have soaked deep into the paper, creating a finely dotted effect rather than a clearly defined photographic representation. Other images retain a hint of colour and are bathed in a coarse red hue. Curfew, 2018, depicts a bare light bulb, a recurring symbol in Brassington’s work, hanging above the face of a cherubic child. There is innocence in Curfew but also foreboding. 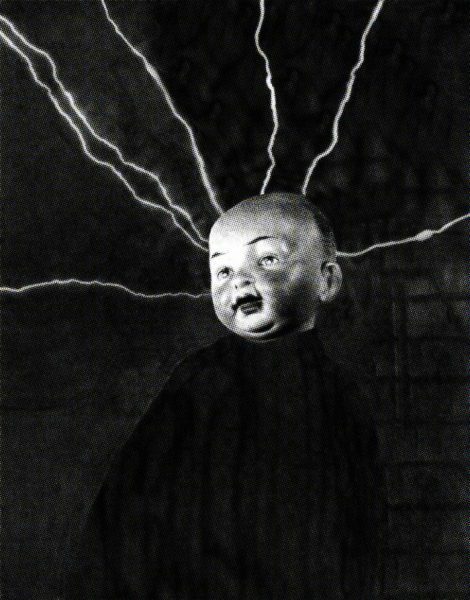 Similarly, in Electric, 2018, an antique doll’s head is framed by white hot electrical zaps as its body remains cloaked in black fabric. An experiment gone wrong or a halo emitting spiritual forces, Electric successfully evades a concrete interpretation. Brassington’s work exudes mystery in spades and embodies a curious femininity and elegance. Alongside the images of faces are her trademark depictions of the body, elongated just beyond the norm or with bones pressing beneath the skin at weird angles. In Sans, 2018, we see the bare back of a figure with outstretched arms, positioned in such a way that the shoulder blades poke out triangularly, appearing like stunted wings or budding breasts. For me, this image is a highlight as I am drawn to Brassington’s ability to convert the physical body into something unnervingly beautiful. Looking at Brassington’s work, I am reminded of fellow Australian photographer Polly Borland, whose portraits of British actor Gwendoline Christie in the 2008 Bunny series evoke a comparable sense of bodily distortion and uneasy beauty. 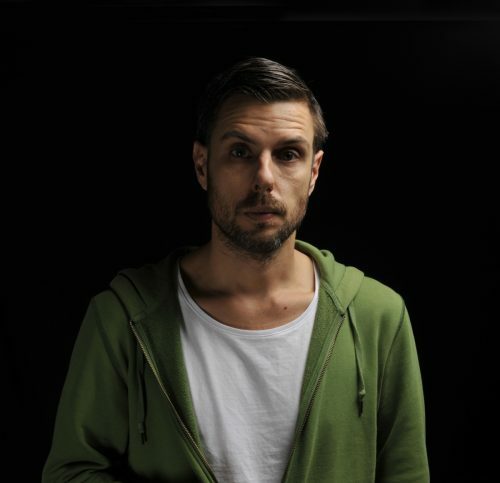 However, while Borland manipulates and augments the body like a living sculpture, Brassington achieves a similar end by manipulating the image instead. As a result, Brassington imbues her images with a surreal grace, tipping any sense of familiarity on its head and skilfully directing the photographic image to be both appealing and beguilingly threatening. 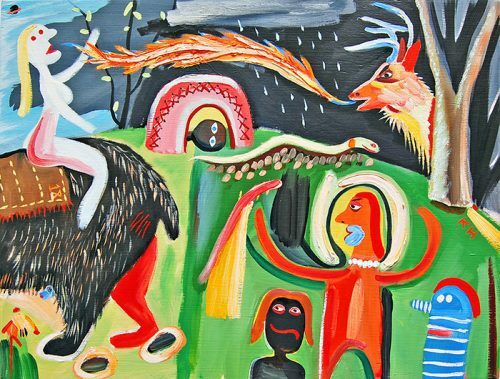 Sam Field’s paintings are like colonialist postcards from a post-apocalyptic Australian landscape. His terrains are assembled by combining national logos and images – from vintage Channel Nine logos and football teams, to Blundstone boots and lyrebirds.